The realm of fanfic isn't usually our forte, but every so often a creative mind produces something that expands on an existing concept in such a way that it demands attention. 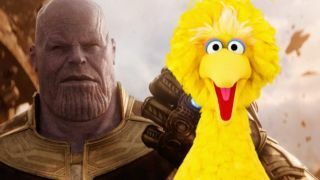 Today, that something is a short story depicting what happens on Sesame Street after the events of Avengers: Infinity War. Yes, really. And yes, I know - it sounds dumb, but just hang with it and you'll see what I mean. Also, even though Infinity War came out back in April (and hits digital services today, with physical copies coming August 14), I'm still going to put this out there: SERIOUS SPOILERS FOR AVENGERS: INFINITY WAR AHEAD. Still here? Good. Let's set the stage: Thanos has finally collected all of the Infinity Stones and accomplished his goal. With a snap of his fingers, he has wiped out half of all life. How on Earth do the puppets of Sesame Street explain what just happened to kids who tune in? Or, assuming the world of Sesame Street is as real to its inhabitants as the MCU is to The Avengers, how do Big Bird and co. react to a world post-snap? That was the question posed on the allthefeelings Tumblr a few days ago. And while the original poster thought there might be something to Ernie getting turned to dust and Bert sitting alone and missing him, "for the episode to function there needs to be something they’re teaching the audience besides ennui, and that is where I’m really stuck." That's where Tumblr user intosnarkness swooped in to save the day. Or ruin it, depending on how you feel about Big Bird being sad. "Big Bird has been waiting for the store to open for a very long time now. He’s a patient bird, and he knows about waiting his turn, but his watch has the big hand on the three and the little hand on the nine and he’s pretty sure that Alan usually open the store when the little hand is on the seven." "Chris is crying a little, a few small tears pooling at the side of his eyes, and Big Bird wants to do something, wants to say something, but he kinda feels like crying too, and doesn’t know what will help. 'I don’t know,' Chris says. 'I think the only thing we can do is be here for each other, and love each other, and take care of each other. When things are scary, and when bad things happen, the most important thing to do is look around at the people who are still here, and try to do your best for them.'" Head on over to intosnarkness' Tumblr to read the whole thing. Today's heartbreak brought to you by the number 1/2. You can own Avengers: Infinity War on digital starting today, but you might want to opt for the Avengers: Infinity War extended cut with 30 minutes of extra footage that dives deeper into Thanos' backstory.